I received an e-mail yesterday (someone used the button! :D) from a certain Levi, asking for various bits of advice, so I thought I'd stick some of it down in a blog post for future reference. So here's a small guide to starting out with a pre-heresy army - particularly Iron Hands. So, let's start with the basics, then move through the armour marks. The Iron Hands Tactical Squad box set is a good place to start. While it isn't the steal it used to be, it's still not bad at 25 squids. You actually get almost enough pieces for 12 models (you need two extra backplates) and some very nice bionic-y metal parts. 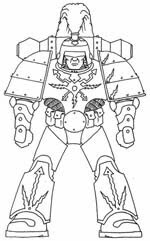 Remember though, that pre-Heresy, only the Emperor's Children were accorded the right to wear an aquila (two-headed eagle) on their breastplate, so you'll either have to file off or bulk out the chests with that detail on. Of course, you don't have to use that box set. If you're feeling adventurous, you can make the bionics yourself by cutting off sections of limbs and replacing them with various bits, ranging from electronics from an old remote, to bits of wire and plasticard (styrene) rods/tubes. Using the standard box sets, you can achieve some very good results. Here's a decent tutorial. Get lots of these. Shaving down the skull will give you a perfect cog and a nice flat surface for your clan marking, although you could leave the skull and have that as such. These power cables are also VERY useful - both for bionics and adding random detail to just about anything. The bag comes with a series of different-sized wires, ranging from vehicle-sized to ones more suited to infantry. For pre-heresy armour marks, I'll go through each one with a few comments. 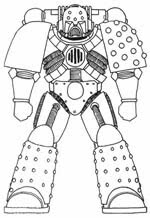 This is the original power armour used by the barbarian tribes of earth. It only enhances upper body strength - the legs and pelvis are adorned in the 30-something-k equivalent of plate mail. This type of armour was only really used during the Unification Wars, as it's lack of respiratory equipment - as well as a sealed environment - make it practically useless in space. Elements of the design can however be ported over to different marks for variety, such as the layered shoulderpads and the thunder/lightning ornamentation - the Emperor's own heraldry. This armour came into use universally at the start of the Great Crusade. The outer planets of the solar system were taken using this armour. It provides a sealed environment and full auto-senses. Some models seem to have had a fixed helmet. Converting this type of armour would be quite a challenge - the amount of layered plates all over the armour and the distinct breastplate mean you're probably going to have to break out the modelling putty. You could always use the Armour Through The Ages box set, but metal is a pig to convert with, and you'll definitely want some different poses - the original has an unnatural "leaning forward" pose that just doesn't look right. It might be worth picking up that box set for reference as you work on different armour marks though. Oh yes, High Marshal Helbrecht is wearing either an ornamented MkI suit, or a later design artificed to look like Crusade Armour. Master of the Arsenal - very ornate example, perfect for a Pre-Heresy Captain, and there seems to be enough flexibility in the model to be able to perform weapon swaps relativeley easily. Sergeant Chronus - This pack is a pretty good deal - you get a full suit of MkIII with a variant type of helmet and a MkIII torso in the same blister. The ultramarine symbols are a pain to remove without scuffing the rivet detail. Iron Warriors Warsmith - This guy just looks awesome - and is perfect for Iron Hands, especially. Though not true MkIII (he has a MkVII "boot" on), he's customised himself enough for it to not really matter. Iron Warriors Conversion Pack - Though the chestplates are definitely useful (you could probably use them as a basis for MkII armour types), the best thing about this pack, in relation to Iron armour is the helmets which are some of the most appropriate bits you could get. 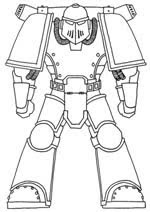 This armour was supposed to be the final Mark to be produced - the epitome of armour engineering (at least until the Legions were completely re-equipped with Terminator Armour). Though it became available late in the Crusade, a few of the Legions were well along in switching to this new Mark. It's features are much closer to the current types of armour, so make it one of the easier armour types to convert. It's main differences are the snout on the helmet, the breastplate, groin guard and kneepads. Red Scorpion Upgrade Kit - this pack has been the bread and butter of pre-Heresy modellers ever since it came out. You get 11 MkIV heads and torsos, as well as a powersword-armed bionic arm and a pair of shoulderpads that My Wargame thinks suit the MkIII armour very well. Red Scorpion Vanguard Veterans - This pack is less useful to the pre-heresy enthusiast. Though it does give you 5 MkIV torsos and heads, they are so covered in religious ornaments as to make them almost not worth it. The thing of greatest note would be Sergeant Culln's legs - they are true MkIV legs. Buying a pack per marine is not really feasible, but you could get hold of one for reference though. Black Templar Sword Brethren - This would again be for reference - one of the Brethren has MkIV knee pads (bottom-right on the link). Apart from maybe Imperial Fist Huscarls or Word Bearers, the model itself is a bit useless for our intentions. As the Heresy broke out, MkIV armour was found to be lacking due to the exotic materials that were needed to construct it. 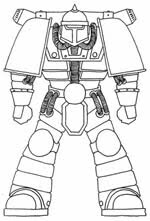 MkV was brought out as a stop-gap and could conceivably be patched up with any old armour the Techmarines had lying around. The helmet itself is a prototype for the Terminator project and due to the inferior materials used in it's production, molecular bonding studs had to be used on the areas most likely to be facing the enemy. - Avoid the aquila breastplates - either that, or file them down. 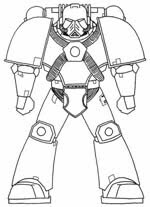 - Reserve the blank breastplates (the one with the skull in the middle of the chest) as well as any filed-down aquila ones for marines with boltguns or heavy weaponry. You don't want to waste bits that cost a lot (in terms of money or effort) on a model that is going to hide most if not all of that detail. - It may be an idea to have your pre-Heresy army as a side project while you focus on your main army. That way, you can buy the bits you need for your current army and just set any useful bits to the side for your Pre-H one. If you go out to actively buy bits for a pre-heresy army, you'll find the costs mounting up VERY fast. I've found it better, for my peace of mind, to let the bits build up naturally. - AOBR marines can be converted, quite easily, to Heresy era ones (as shown in this tutorial) and make a great way of bulking out your forces. Right, I think I'm burnt out for now, so I hope this helps Levi (and anyone else looking into pre-heresy modelling). This is by no means a complete article - the amount of depth it's possible to go to with this subject is staggering. For the interested, I suggest you check out The Great Crusade - a forum dedicated solely to Pre-Heresy with some great (and very helpful) characters on there. While they don't all have pre-heresy stuff on them, they are well worth a look-see.